These are representative of what my great Uncle Joe's tenderloins should end up looking like! These are cut from a pork loin into about 1" slices which are spiced and pounded out flat to make them about 1/2" thick. For the traditional breading we would use all purpose flour and in the Paleo friendly version of this classic, we use gluten free flour mixed with non gmo corn flakes/corn flake crumbs. These are the best tenderloins I have ever experienced and I have tasted them all over the country! Eggs 5-8 depending on size of eggs. 1. Cut tenderloin into 1” slices. 2. Season tenderloin with Kosher Salt, Black Pepper & Smoked Paprika liberally on both sides. 3. Pound tenderloins into approx. 1/2'” thickness until they are even thickness. 4. Mix eggs and almond milk in a 75%/25% ratio to make egg wash for tenderloins in one of the pie plates. 5. Mix the gluten free flour and corn flake crumbs together in the other pie plate for the coating. 6. 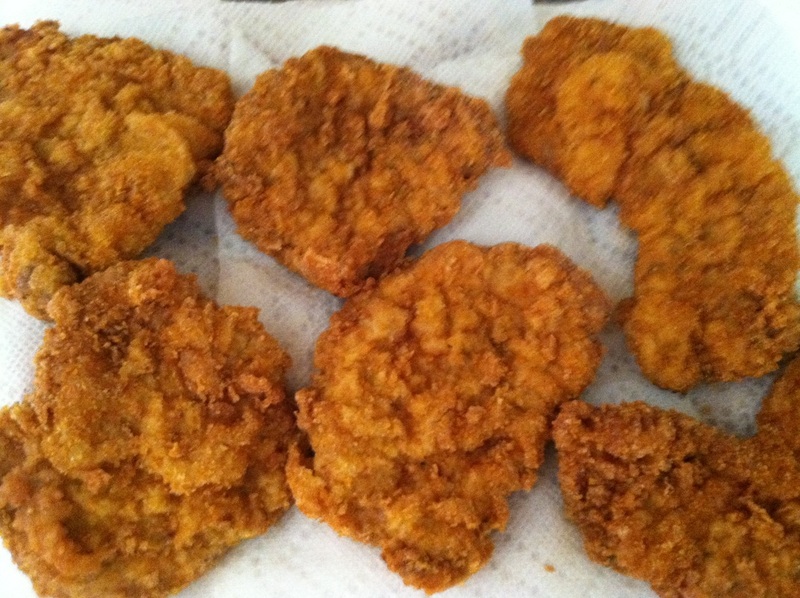 Heat the oil in the frying pan so the tenderloins float when put into the oil to fry. 7. Fry until golden brown and put on paper towels to drain. Once the tenderloins are cool, store in Ziploc bags in the refrigerator. Eat in the next 7 days and enjoy! Pounding the tenderloins even and the right thickness takes practice so don’t be discouraged! Is the name of the Cookbook I am working on now! 1. Reduces the amount of time necessary to make high quality, great tasting meals for you and yours! 3. Inspires you to re-learn perhaps how to cook so that the food we cook is not making us SICK! 4. Teaches how to use different cooking techniques to enhance the flavors, build depth into our dishes and how to better use higher quality foods in a healthy, safe manner. 5 large Mushrooms-- Bella preferred. Olive Oil--Enough to coat peppers to roast & coat noodles after cooked. 2-3 Tablespoons of Cilantro-- Just throw the entire stalk in! 2 cups of Mild Cheddar cheese-- Non Paleo! 1. Poach chicken breasts in water, coffee, cilantro, tomatoes & spices for about 10 min per side at simmering boil. Chicken should be cooked with no redness or blood when breast is punctured. 2. Par boil noodles for 4 minutes in boiling water and turn off water. 3. Drain noodles after 5 minutes and toss with olive oil & 1/2 of cheese in a large bowl. 5. Heat oven to 400 degrees on Bake and bake covered for 40 minutes. Uncover for 15 minutes and continue to cook until casserole is hot n bubbly! This is a great recipe not only for ribs, both pork & beef but also great for steaks & fish! This is a very easy recipe to make up and save in your own spice jars. 2-3 racks of pork ribs (6-8 bone racks) about 4-6 lbs. 2 cans of Apricot Nectar usually found in the Mexican section of the store. 3 cups of water, you can add more to cover the racks completely. 1 Cup of brown sugar, I like dark brown but you can use any! 2 Tablespoons of Old Bay Seasoning, usually used for seafood but is delicious here! 2 Teaspoons of Garlic Paste or 4-6 cloves of fresh garlic, smashed flat skin and all! Combine all of the marinade ingredients in a medium saucepan and bring to a simmer. Simmer for 10 minutes to release the flavors of the garlic & seasonings! Cool to room temperature, add ice to speed up cooling but make sure marinade is not hot when you pour it over the racks of ribs. I usually use a new kitchen trash bag in a roasting pan to hold the ribs & marinade in the refrigerator overnite, push out most of the air and tie to keep ribs covered. Note: This recipe is enough rub to season 8-10 lbs of ribs. 2 Tablespoons of Brown Sugar, Dark Preferred. 1 Teaspoon of Black Pepper, fine grind preferred. Remove your ribs from the refrigerator and remove from the marinade. Pat dry before rubbing the racks with your Bad to the Bone Rib Rub! Rub the rib rub into the rib racks, both sides and let sit for a minimum of 15 minutes before putting them on the grill, 350 degrees usually works best. Grill over direct heat for 7-10 minutes per side before sliding ribs over to part of grill that is not on to cook using “Indirect” heat and grill for 20-30 minutes…Depending on how much you open the lid! Once the ribs are grilled to perfection(Your Call!) and cooled off, you can glaze with the “K.C. Special Rib Glaze”. Mix together until jelly is much thinner but will stick to the ribs when painted on with a basting brush. Let ribs sit for 10-20 minutes with the glaze on before you divide the rib racks. Put olive oil, kosher salt, chopped chives, black pepper & lemon juice on cutting board before you start to divide rib racks and mix well. Coat indiviual ribs with this as you divide them and transfer to holding dish ….You are now ready to sample the best ribs you have ever had! Enjoy your taste of Kansas City and the “bad to the Bone” ribs! Caveman's Rules for Living # 5 -- Heal thy Gut! Hippocrates said this more than 2,000 years ago, but we’re only now coming to understand just how right he was. Research over the past two decades has revealed that gut health is critical to overall health, and that an unhealthy gut contributes to a wide range of diseases including diabetes, obesity, rheumatoid arthritis, autism spectrum disorder, depression and chronic fatigue syndrome. In fact, many researchers (including myself) believe that supporting intestinal health and restoring the integrity of the gut barrier will be one of the most important goals of medicine in the 21st century. There are two closely related variables that determine our gut health: the intestinal microbiota, or “gut flora”, and the gut barrier. Let’s discuss each of them in turn. When the intestinal barrier becomes permeable (i.e. “leaky gut syndrome”), large protein molecules escape into the bloodstream. Since these proteins don’t belong outside of the gut, the body mounts an immune response and attacks them. Studies show that these attacks play a role in the development of autoimmune diseases like Hashimoto’s and type 1 diabetes, among others. The phrase “leaky gut” used to be confined to the outer fringes of medicine, employed by alternative practitioners with letters like D.C., L.Ac and N.D. after their names. Conventional researchers and doctors originally scoffed at the idea that a leaky gut contributes to autoimmune problems, but now they’re eating their words. It has been repeatedly shown in several well-designed studies that the integrity of the intestinal barrier is a major factor in autoimmune disease. This new theory holds that the intestinal barrier in large part determines whether we tolerate or react to toxic substances we ingest from the environment. The breach of the intestinal barrier (which is only possible with a “leaky gut”) by food toxins like gluten and chemicals like arsenic or BPA causes an immune response which affects not only the gut itself, but also other organs and tissues. These include the skeletal system, the pancreas, the kidney, the liver and the brain. This is a crucial point to understand: you don’t have to have gut symptoms to have a leaky gut. Leaky gut can manifest as skin problems like eczema or psoriasis, heart failure, autoimmune conditions affecting the thyroid (Hashimoto’s) or joints (rheumatoid arthritis), mental illness, autism spectrum disorder, depression and more. Researchers have identified a protein called zonulin that increases intestinal permeability in humans and other animals. This led to a search of the medical literature for illnesses characterized by increased intestinal permeability (leaky gut). Imagine their surprise when the researchers found that many, if not most, autoimmune diseases – including celiac disease, type 1 diabetes, multiple sclerosis, rheumatoid arthritis and inflammatory bowel disease – are characterized by abnormally high levels of zonulin and a leaky gut. In fact, researchers have found that they can induce type 1 diabetes almost immediately in animals by exposing them to zonulin. They develop a leaky gut, and begin producing antibodies to islet cells – which are responsible for making insulin. In Step #1: Don’t Eat Toxins, I explained that one of the main reasons we don’t want to eat wheat and other gluten-containing grains is that they contain a protein called gliadin, which has been shown to increase zonulin production and thus directly contribute to leaky gut. If the weather outside does not lend itself to barbequing, you can prepare this beef brisket in minutes and place in your slow cooker or roasting oven. You can substitute 1-2 Cups of your Favorite BBQ sauce for the KC Sauce but my recipe is so good, you should make it from scratch! I like to try and keep the brisket all in one piece but if your slow cooker is too small you can cut up the brisket into pieces and stack them in the slow cooker! 3-5 lbs Beef Brisket-Leave fat on but pierce meat thru fat to allow marinade to flavor it. In a medium skillet, melt the butter over medium heat. Add the onion and cook until softened stirring often about 5 minutes. Add the garlic and cook another 1-2 minutes, stirring all the while. Stir in rest of the ingredients and simmer for 3 minutes. Put brisket into slow cooker and pour sauce over brisket. Transfer brisket to a platter and cover with foil to keep warm. Transfer the sauce to a medium saucepan and simmer over medium heat, stirring often until reduced and a little thicker. If there is fat on the top of the sauce, you can skim it off or just incorporate it into the sauce if that is your taste! Using a sharp knife, slice the meat against the grain into slices (unless it is easier to pull it apart with your fingers! My family has enjoyed this BBQ Brisket for many years and it continues to be a favorite of the younger members of the clan! Enjoy! Get nutrients from food whenever possible Humans are adapted to getting nutrients from whole foods. Most nutrients require enzymes, synergistic co-factors and organic mineral-activators to be properly absorbed. While these are naturally present in foods, they are often not included in synthetic vitamins with isolated nutrients. In short: get nutrients from food, not supplements, whenever you can. Take nutrients in their naturally occurring form whenever possible Synthetic, isolated nutrients don’t always have the same effect on the body. It matters whether the nutrients have been produced by technologic or biological processes, because industrial processing sometimes creates an entirely new compound with different physiological actions. Trans fat produced in ruminant animals (such as conjugated linoleic acids in dairy products) are beneficial to health, whereas trans fats produced in the processing of industrial seed oils are highly toxic. Folic acid is another example. The naturally occurring form of folate is not folic acid, a compound not normally found in food or nature, but tetrahydrofolate. While folic acid can be converted into folate, that conversion is poor in humans. It’s also important to note that unlike natural folate, folic acid does not cross the placenta. This is significant because folate is a crucial nutrient for pregnancy, and while folic acid can prevent neural tube defects it doesn’t have the other beneficial effects of folate. What’s more, several studies have shown that folic acid – but not natural folate – increases cancer risk. Unfortunately, folic acid is what’s often used in multivitamins, because it’s significantly cheaper than natural folate. Be selective with your supplementation. Multivitamins have become increasingly popular: half of Americans currently take one. But is this a good idea? Most studies show that multivitamins either provide no benefit, or may even cause harm. A study in the Archives of Internal Medicine showed that multivitamins have little to no influence on the risk of common cancers, CVD or total mortality in postmenopausal women. A now infamous meta-analysis in the Journal of American Medical Association, which looked at over 68 trials with 230,000 pooled participants, found that treatment with synthetic beta carotene, vitamin A and vitamin E may increase mortality. The problem with multivitamins is that they contain too little of beneficial nutrients like magnesium, vitamin D and vitamin K2, and too much of potentially toxic nutrients like folic acid, calcium, iron and vitamin E. This means that multivitamins can actually cause nutrient imbalances that contribute to disease. Another problem is that multivitamin manufacturers often use the cheapest possible ingredients, such as folic acid instead of natural folate – the consequences of which we discussed above. Which supplements may be necessary? At this point you might be thinking I’m against supplementation entirely. Not so. No matter how well we eat, some nutrients are difficult to obtain enough of from food alone. There are also circumstances where are need for certain nutrients may increase, such as vitamin C during infections and magnesium with blood sugar imbalances or metabolic problems. In these cases, it makes sense to supplement selectively with beneficial nutrients. Vitamin A (Retinol) Vitamin A is important catalyst for a variety of biochemical processes in the body. It’s required for assimilation of protein, minerals and water-soluble vitamins, and it also acts as antioxidant > protecting body against free-radical damage and diseases like cancer. Vitamin A plays a crucial role in reproduction, promoting full-term pregnancy and proper development of face (eyes, nose, dental arches & lips). The RDA for vitamin A (2,600 IU) is woefully inadequate, and even then, over 25% of American consume less than half of the recommended amount. Native populations such as the traditional Inuit – which were free of modern, degenerative disease – got much more vitamin A than the average American. The Greenland Inuit of 1953, prior to much contact with the Western world, got about 35,000 IU of vitamin A per day. Vitamin A (retinol) is only found in significant amounts in organ meats, which explains why many Americans don’t get enough of it. If you follow my recommendations in #2: Nourish Your Body, and you do eat organ meats (especially liver), you’re probably getting enough vitamin A and thus don’t need to supplement. However, if you’re like most Americans and you’ve never eaten liver in your life, you would benefit from supplementing with A. It is true that vitamin A is potentially toxic. Some evidence suggests that excess vitamin A increases the risk of osteoporosis. For example, this study showed both low and high serum A carried double risk of fractures as did optimal levels. But if we dig deeper we find that excess vitamin A only causes problems against a backdrop of vitamin D deficiency. In his excellent article Vitamin A on Trial: Does Vitamin A Cause Osteoporosis, researcher Chris Masterjohn summarizes evidence demonstrating that vitamin D decreases the toxicity of and increases the dietary requirement for vitamin A. Studies show that supplementing with vitamin D radically increases the toxicity threshold of vitamin A. In a hypothetical 160 lb. person, vitamin D supplementation increases the toxicity threshold of vitamin A to more than 200,000 IU/d. You’d have to eat 22 ounces of beef liver or take 5 TBS of high vitamin CLO each day to get this amount. Not likely! Vitamin D Much has been written about the need for and benefits of vitamin D supplementation over the past several years – and with good reason. It’s absolutely critical for health, and up to 50% of Americans are deficient. We can get vitamin D from two sources: food, and sunshine. Seafood is the only significant source of vitamin D, but you’d still have to eat a lot of it to get enough. 8-9 ounces of herring provides about 2,000 IU of vitamin D, which is a minimum daily requirement for most people to maintain adequate blood levels. Sunlight converts a precursor called 7-dehydro-cholesterol in our skin to vitamin D3. This D3, along with the D3 we get from food, gets converted by the liver into 25-hyrdroxy-vitamin D (25D), which is what typically gets measured when you have a vitamin D test. The optimal 25D level is somewhere between 35 and 50 ng/mL. Contrary to what some researchers and doctors have recommended, there’s no evidence that raising blood levels of 25D above 50 ng/mL is beneficial, and there’s some evidence that it may cause harm. Studies show that bone mineral density peaks at 45 ng/mL and then falls again as 25D levels rise above 45. Other studies have shown that the risk of kidney stones and CVD increase with high 25D levels, due to elevated serum calcium levels that accompany excess vitamin D.
What about sunlight? Well, in summer mid-day sun with pale skin, 30 minutes of direct sunlight will produce 10-20,000 IU of vitamin D. But this is a best case scenario. With darker skin, or different times of year, or buildings that block the sunlight, or increased time spent indoors, we won’t be producing that much. It’s also true that aging, overweight and inflammation reduce our conversion of sunlight to vitamin D. This is why sunlight alone isn’t normally a sufficient source of vitamin D.
With this in mind, most people should supplement with D. The amount needed to maintain blood levels of 35-50 ng/mL varies depending on some of the factors I’ve listed above, but in my clinical experience it’s usually somewhere between 2,000 – 5,000 IU. With vitamin D, it’s important to test your levels, begin supplementation, and then re-test a few months later to determine the correct maintenance dose. Vitamin K2 Vitamin K2 may be the most important vitamin most people have never heard of. It’s needed to activate proteins and it also regulates calcium metabolism (keeping it in the bones and teeth where it belongs, and out of the soft tissue where it doesn’t belong). Elevated blood calcium significantly increases the risk of cardiovascular disease (CVD), which explains why vitamin K2 has been shown to prevent atherosclerosis and heart attacks. It also strengthens bones. Unfortunately, many (if not most) of Americans are deficient in vitamin K2. It’s important to point out that vitamin K2 is not the same as vitamin K1, which is found in green, leafy vegetables like kale and collards. Some K1 is converted into K2 in our bodies, but that conversion is inefficient in humans. It is efficient, however, in ruminant animals – which is why grass-fed dairy is the most convenient source of vitamin K2 in the diet. This is only true in animals raised on pasture, because it is eating the K1-rich grass that allows them to convert it into K2. Most people should aim for at least 100 mcg/d from a combination of food and supplements. If you eat a large amount of cheese from grass-fed cows and pastured egg yolks, you may be able to get this amount from food alone. 100 g of hard cheese contains 67 mcg, and 6 pastured egg yolks contain about 32 mcg. Otherwise, supplementation is probably beneficial. I recommend a dosage of 1 mg/d in the MK-4 form, which is the form of vitamin K2 found in pastured dairy and the one shown to have the most benefit in clinical studies. There is another form, MK-7, that is found in fermented foods like natto, but it has not demonstrated the same properties as MK-4 in clinical studies. Magnesium There are few compounds in the body more important to overall health than magnesium. Over 300 enzymes need it, including every enzyme associated with ATP, and enzymes required to synthesize DNA, RNA and proteins. Magnesium also plays an important role in bone and cell membranes, as it helps to transport ions across the membrane surface. Studies show that most Americans are deficient in magnesium. The median intake across all racial groups is far below the RDA, which is 420 mg/d for men and 320-400 mg/d for women. Although half of Americans take a multivitamin daily, most don’t contain enough magnesium to prevent deficiency. Magnesium is also difficult to obtain from food. Nuts and seeds are the highest source, but it’s difficult to eat enough of them to meet magnesium needs without getting too much polyunsaturated fat. Another issue is that magnesium levels in food have dropped as modern soils have become increasingly depleted. What this means is that if you’re not supplementing with magnesium, you’re probably not getting enough. And magnesium deficiency is no small thing. It has serious – even fatal – consequences. It produces symptoms like muscle cramps, heart arrhythmias, tremor, headaches & acid reflux, and it’s associated with CVD, hypertension, metabolic syndrome, diabetes, migraines, PMS, asthma, hypothyroidism. In fact, it’s hard to find a modern disease magnesium deficiency isn’t associated with. Because of this, I think everyone should supplement with magnesium. Intake of 400 – 800 mg/d from a combination of food and supplements is an optimal range to shoot for. Since most people get less than 250 mg/d from food, a dose of 400 – 600 mg/d in supplement form is ideal. I recommend using chelated forms of magnesium like glycinate and malate, because they’re better absorbed and tend to have fewer side effects. Vitamin C Vitamin C is needed for building the structural components of the body, and for maintaining levels of glutathione, the master antioxidant in the body. But vitamin C deficiency is also common: studies suggest that 34% of men and 27% of women don’t get enough. This is especially true for the elderly and those struggling with chronic illness. 400 mg/d is the saturation range in healthy people, and that number is probably higher in the elderly and the sick. As with the other micronutrients in this article, it’s difficult to obtain adequate levels of vitamin C from the diet. Acerola cherries are the highest food source, with 1677 mg per 100g. A cup of cooked red peppers has 235 mg, which is one of the highest dietary sources. I’m somewhat less certain about the need to supplement with vitamin C, but in general I recommend approximately 500 mg to 1 g of vitamin C each day. If you’re dealing with a chronic health challenge, or fighting an infection, you can take several grams a day with no toxic effects. It’s best to space the doses out to avoid diarrhea, however. Other contenders In addition to the fat-soluble vitamins A, D & K2, and magnesium and vitamin C, some may want to consider supplementing with selenium and iodine. Selenium plays important role in thyroid function, which affects every aspect of physiology. The recommended dose is approximately 200 mcg/d. Selenium is plentiful in organ meats, ocean fish, and in brazil nuts. One brazil nut contains 100 mcg of selenium, but it also contains a whopping 1 g of omega-6 linoleic acid, which as you know from previous articles in the series, we want to limit significantly. This is why I don’t recommend brazil nuts as a source of selenium. Ocean fish are also good sources of selenium. 100 g of cod contains about 150 mcg. Iodine also plays a crucial role in thyroid function, and it prevents brain damage and strengthens the immune system. The amount iodine needed for thyroid function is incredibly small: we need about a teaspoon of iodine over a lifetime to avoid deficiency. I’m not convinced humans need to supplement with iodine above what can be obtained from seafood, but some research does suggest that increased intake of iodine is beneficial. This is especially true if you’re fighting a chronic infection or dealing with a hypothyroidism caused by iodine deficiency. But be careful: iodine can trigger and flare autoimmune diseases, especially Hashimoto’s and Graves’(autoimmune thyroid disease). In the U.S., 9 out of 10 women with hypothyroidism actually have Hashimoto’s, so the typical advice to supplement with iodine if you are hypothyroid is dangerous. I’ve written extensively about this in my special report on thyroid disease. For those without autoimmune disease, a dose of 12.5 mg – 50 mg per day may be beneficial, but it’s best to work up slowly over time, beginning at a much lower dose. The third in the series....adapted from Chris Kresser's 9 Steps to Perfect Health. New research is revealing the harm these newfangled processed foods have on us almost every day. Just yesterday a study was published demonstrating that emulsifiers used in packaged foods ranging from mayonnaise to bread to ice cream increase intestinal permeability (“leaky gut”) and cause a chain reaction of inflammation and autoimmune disease. Another study showed that diet soda consumption increases your risk of stroke and causes kidney damage, possibly because of the phosphoric acid used as an acidifying agent to give colas their tangy flavor. While the reasons to eat pasture-raised animal products and wild-caught fish span social, political, economic and nutritional considerations, I’m only going to focus on nutritional factors here. For a more comprehensive discussion, check out Eat Wild. Ducket and colleagues studied the omega-3 and omega-6 content of both pasture-raised and grain-fed animal products. They found that grass-fed beef had an n-6 ratio of 1.65, whereas grain-finished beef was 4.84. They also found that grass-feeding decreased total fat content by 43%. Another interesting thing to note, which I mentioned in Step #2: Nourish Your Body, is the high n-6 ratio of chicken. 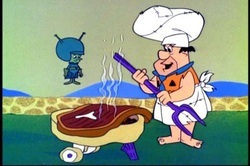 In fact, it has about 14 times more n-6 than pasture-raised beef. This is why I recommend eating mostly beef, lamb and pork, and limiting chicken to the occasional meal (assuming you like it, that is). And when you do eat chicken, it’s best to choose skinless breast and cook it in a healthy traditional fat like butter or coconut oil, because the dark meat with skin has the highest concentration of n-6 fat. CLA may have anti-cancer properties, even in very small amounts. In animal studies, CLA at less than one-tenth of one percent (0.1%) of total calories prevents tumor growth. In a Finnish study on humans, women who had the highest levels of CLA in their diet had a 60 percent lower risk of breast cancer than those with the lowest levels. In another human study, those with the highest levels of CLA in their tissues had a 50 percent lower risk of heart attack than those with the lowest levels. Pasture-raised animal products are the richest known source of CLA in the diet, and are significantly higher in CLA than grain-fed animal products. When ruminant animals like cows and sheep are raised on fresh pasture alone, their products contain from 3-5 times more CLA than products from animals fed grain. Grass-fed products also have a lot more selenium than grain-fed products. Selenium plays an important role in thyroid function, has antioxidant effects and protects the body against mercury toxicity. Grass-fed bison has 4 times more selenium than grain-fed bison. We see a similar difference between eggs from hens raised on pasture, and those raised in confinement. Pasture-raised hens contain as much as 10 times more omega-3 than eggs from factory hens. Pastured eggs are higher in B12 and folate. They also have higher levels of fat-soluble antioxidants like vitamin E and a denser concentration of vitamin A.
Farmed fish contain excess omega-6 compared to wild-caught fish. Tests conducted in 2005 show that wild-caught salmon contain 10 times more n-3 than n-6, whereas farmed salmon have less than 4 times the amount of n-3 than n-6. Another study found that consuming standard farmed salmon, raised on diets high in n-6, raises blood levels of inflammatory chemicals linked to increased risk of cardiovascular disease, diabetes, Alzheimer’s and cancer. Wild salmon also contains 4 times as much vitamin D than farmed salmon, which is especially important since up to 50% of Americans are deficient in this important vitamin. Organic plant foods contain, on average, 25 percent higher concentrations of 11 nutrients than their conventional counterparts. In particular, they tend to be higher in important polyphenols and antioxidants like vitamin C, vitamin E and quercetin. A typical carrot, for example, has traveled 1,838 miles to reach your dinner table. Days – maybe more than a week – have passed since it was picked, packaged and trucked to the store, where it can sit on the shelves even longer. The problem with this is that food starts to change as soon as it’s harvested and its nutrient content begins to deteriorate. Total vitamin C content of red peppers, tomatoes, apricots, peaches and papayas has been shown to be higher when these crops are picked ripe from the plant. This study compared the Vitamin C content of supermarket broccoli in May (in season) and supermarket broccoli in the Fall (shipped from another country). The result? The out-of-season broccoli had only half the vitamin C of the seasonal broccoli. Without exposure to light (photosynthesis), many vegetables lose their nutrient value. If you buy vegetables from the supermarket that were picked a week ago, transported to the store in a dark truck, and then stored in the middle of a pile in the produce section, and then you put them in your dark refrigerator for several more days before eating them, chances are they’ve lost much of their nutrient value. A study at Penn State University found that spinach lost 47% of its folate after 8 days. Another important benefit of organic produce, of course, is that it’s grown without pesticides, herbicides and other harmful chemicals that have been shown to cause health problems – especially in vulnerable populations like children. A study published in the journal Pediatrics concluded that children exposed to organophosphate pesticides at levels typically found in conventional produce are more likely to develop attention deficit hyperactivity disorder (ADHD). A panel of scientists convened by President Obama to study the effect of environmental toxins on cancer released a report in 2010 urging Americans to eat organic produce grown without pesticides, fertilizers or other chemicals. The report states that the U.S. government has grossly underestimated the number of cancers caused by environmental toxins. Community food systems promote more food-related enterprises in proximity to food production, marketing, and consumption. Such systems enhance agricultural diversity, strengthen local economies (including farm-based businesses), protect farmland, and increase the viability of farming as a livelihood. Local food systems mean less long-distance shipment of the produce we enjoy, which means decreased use of nonrenewable fossil fuels for food distribution, lower emission of resulting pollutants, and less wear on transcontinental highways.